Hepatocellular carcinoma (HCC) is the most frequently diagnosed type of liver cancer and the third leading cause of cancer deaths worldwide. Chronic liver disease, which can be triggered by viral hepatitis, cirrhosis, and exposure to hepatotoxins, can lead to liver damage and promote HCC carcinogenesis. Although the pathophysiological steps that lead to the development of HCC are relatively well characterized, the cellular source of HCC is not currently known. Owing to their role in the regeneration of liver tissue, hepatocytes, liver progenitor/biliary cells, and hepatic stellate cells (HSCs) have each been suggested as the cellular origin of HCC. Xueru Mu, Regina Español-Suñer, and colleagues at Columbia University and Université catholique de Louvain, respectively, examined the ability of each of these three cell types to form HCC lesions in vivo. Using cell lineage tracing in several genotoxic and non-genotoxic mouse models of HCC, the authors demonstrated that HCC tumors do not arise from progenitor/biliary cells nor do they arise from HSCs. Instead, over 95% of HCC tumors that formed in these mouse models were determined to be of hepatocyte origin. Additionally, the authors showed that the progenitor-like characteristics of many mouse HCCs are not a consequence of progenitor/biliary cell origin but, instead, are a result of dedifferentiation of hepatocytes during the tumorigenic process. This systematic study clearly indicates a hepatocyte origin for most, if not all, of the HCC tumors in these mouse models. Further studies should be undertaken to determine if HCC in humans follows the same pattern. 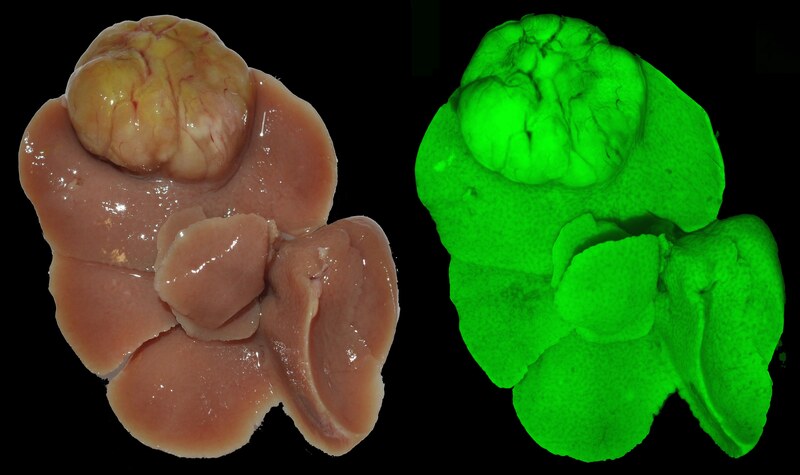 The accompanying image shows a photograph and fluorescent image (hepatocyte-restricted ZsGreen) of a whole liver from the Mdr2 knockout mouse model of HCC. Note that the large tumor on the surface of the liver is ZsGreen positive indicating hepatocyte origin. Citation Information: J Clin Invest. 2015;125(10):3891-3903. https://doi.org/10.1172/JCI77995.